1. I've noticed on many helmets for the War Years there is a square white sticker with a blue star of life on it. Was there a guideline for their issue and wear? 3. If anyone wants to add something or share their own pictures, that would be greatly appreciated. Members wearing a star of life decal on their helmet indicated that they were certified as NYS EMT's. The job had an EMT program that members of the department attended on a voluntary basis. Approximately 2,000 members were certified via the program. Thanks for answering my question, now as a follow up was there any other similar programs or was it a one-off? The Helmet is a16 cone Helmet ...it was manufactured by Cairns & Brothers which was then in NJ. The FDNY EMT program started around '75 or so....I was an instructor in it for awhile...the students attended on their own time & got no pay...the instructors got $5.00 an hr on our days off from the FH....classes were held at several locations around the City ....extrication training (hands on) was held at the old Rock on Welfare Island & at the US Naval Hosp grounds in St Alban's & then the new Rock.... you had the small white Star Of Life sticker on the right rear panel of your Helmet & an FDNY NY State EMT Patch on the left Shoulder of your Turnout Coat....it was always rumored that it would progress into Paramedics along with small response Rig's & a pay raise ..of course this never happened....i do not remember what year the FDNY stopped recertifications etc.....lives were saved thru the program while it existed....one thing i remember was during the extrication classes we held we were provided with junk cars from the City (& they were mostly all junk) however one batch we got once at the Rock (now at the then new Randall's Island) consisted of about a dozen retired NYPD '74 Fury Sedans....there were complete minus lights/sirens & radios & no ignition keys...a few had mileage as low as in the 40 thousands ....we pulled the ignition cylinder & started a few & drove them around the Rock....we saved the best ones until the very last session's & in the meantime we used them to go back & forth from the area by the water where we held hands on drills to & from the lunchroom. Hello lebby, if you don’t mind I would like to add a couple of recollections and thoughts about the leather chapeau. Upon entering FDNY proby school back in the day, there was a salesman from Cairns who would put a contraption on your head and measure your coconut and transfer the readings to construct your personal helmet. The helmet was designed to stay on your head, and it fit perfectly, sans a chin strap or ratchet device. It took months before we received our helmet, as all was hand made at the time. The front piece was fastened by small brass cotter pins, as was the bright orange “proby” insert. I have always felt that your fire helmet was your personal calling card. Your personal trophy! Still to this day, I can remember some of the unique shapes the leather helmet would take on from usage and battles with the red devil. You could literally recognize a member through smoke from the shape of his helmet. The shape, wear and tear gave a size up about your experience quickly. We also called it “saltiness”. You could gauge a covering boss by just taking a glance at his lid if you did not know him. Of course there are the stories of members putting them in heated ovens to create the faux saltiness. There was also known the “Bronx Bend”, where the back of the helmet was bent down usually by pliers. Years ago, the helmet tossed from a fire building indicated a firefighter in trouble. Around 1993 the department began switching to another leather type helmet that was much heavier and cumbersome, this would be my second helmet. It sat high on your head, had reflective stickers, some type of heavy protective liner and a chin strap, which I really did not care for. Many guys had to add a "ratchet device" to tighten onto your head to keep the helmet from falling off. The front piece was fastened by two bolts that came from the inside out, and that is why you see helmets from that era with brass nuts. Personally, I did not like the clean looking helmet, to me, the stains, bumps, tar, soot and grit was paydirt earned. A couple of stories: I knew one war year firefighter who painted his helmet every year for inspection, the dang thing felt like a cinder block, I suggested we use it as a wheel chock! I recall a buff asking a senior war years lieutenant with a pretty cool war-torned banged up helmet if he would consider selling his helmet. The officer said, “nah, you want it...just buy me a replacement that fits”. The buff was gone like a shot to the NJ Cairns plant and back a few days later and the exchange was made. I also watched another senior war time veteran who had just retired, his very last tour, quietly sipping a cup of coffee by his locker with his helmet on his lap, occasionally picking it up and looking it over. A few years ago the 9/11 Museum reached out to me, they knew about the “Bench Photo” that circulated, and asked if I would contribute to the museum artifact collection that would be displayed upon the museum’s opening. I told them they could have the condemned bunker gear, boots, work shirt and flashlight I was wearing in the photo on 9/11, which they happily accepted. Then they requested my helmet. I said I don’t think I can part with it, however I would not mind loaning it to you. We made a deal, the helmet was on display for the first three years when the museum first opened. The museum used my helmet in promos, much to my surprise (photo below). Today it is back on my shelf in my den hanging out with my first helmet. I don’t know why, but when I see FDNY helmets for sale on e-bay I feel a little off. It seems like a historic piece of history, a symbol that paid the price and now just being passed along with no regard or appreciation of the action this helmet might have experienced, once a prize possession, a personal trophy... eventually headed to the big helmet collection in the sky. If it could only tell the story of it’s special history! Thanks Dan for that story. If only those helmets could talk, what a story they could tell. I remember guys from various departments wearing tee shirts that said: "Leather Forever". Many guys felt that during the days of the TV Show Emergency, the helmet that the REAL "JohnnyGage" (Not Dan P that we know from here) wore, had no class compared to the burned and twisted Leather Helmets of the FDNY, as well as some of the busiest depts. across the U.S. I know of a firefighter who felt it was quicker if he were to try and "FLY" off a ladder than to climb down it. His leather helmet was NOT OSHA approved at that time. But when he landed, the back of his helmet hit a three foot cement wall. But that outdated leather helmet probably saved his life. That firefighter who wasn't wearing the helmet that he was supposed to was "me". (picture posted above by Brad Y, "signal73" - THANK YOU). The issue was never pushed because I think the bosses were just happy it wasn't worse. It did result in a dislocated right shoulder and when I came back to full duty, I was told what helmet to wear and what one not to wear by my captain. He made his point very clear and I understood perfectly well after that. That was on Memorial Day, 1984. I gave that helmet to a good friend who was a buff in the neighborhood. When I was assigned as an auxiliary at E 248/B 41 in 1964, I was supplied with standard auxiliary fare: yellow plastic helmet, yellow boots, and a yellow coat that did not have a winter liner. One day I was looking for something in the closet where the chiefs and aides kept their turnout gear. Way in the back of the closet, hanging on a hook, was the helmet of a long retired battalion chief. I tried it on and it fit fairly well. I took it to the Battalion Office and told the Battalion Commander about the helmet and how it fit. He looked at it, looked at me, and said:" it is yours." Of course, I had to paint it yellow but I wore it for almost nine year there. Later, I moved to Fairfield, CT (where Willy D and I were volunteers together) and joined the department there; then I had to paint the helmet black but I wore it for about ten years. I still have the helmet today on a shelf in my home office. Some great stories! 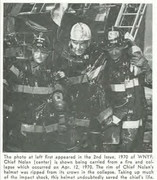 Which of course led to questions, first what year did FDNY switch to composite helmets? Second, on the orginal helmets were the front pieces just pinned right in to the helmet or were there holes which the pins secured too? Lastly, did the old leathers not have chin straps? Thank you in advance. 1...not sure about composite Helmets but i think in '92 the Leather Helmets had the added "impact liner" & everybody had to trade the old ones for a new one with it....2.. On the original Helmets the Front's were originally pinned on with small cotter pin type fasteners. (some which even though not much more the a small paper clip are being sold today on Ebay for outrageous prices ) .. Some guys myself included used alternative fasteners like old Uniform Buttons...& on a History Side Note the Helmet pins were the smaller Buttons but back when ECCs wore a Blue Uniform Cap with rather than their actual Badge they affixed a "Large" Uniform Overcoat Button to the grommet hole in the Uniform Cap.....for some more History on the old Uniform Coats both Blouse & Overcoat the Buttons were held on by a cotter pin type backing thru a grommet hole in it so they could be removed when getting pressed by the cleaners & the big Button was worn by ECC's on their Blue Uniform Caps. Member on the right with the "Bronx Bend"
One summer, a handful of buffs from New Hampshire paid L 38 a visit. They stayed a few days. During their time a few of them headed to Clifton NJ for a tour of the Cairns Helmet factory. When they returned they brought back about two dozen front pieces of all shapes and colors from various fire departments. They were imperfections, most had the name of the town misspelled. As they sat in the kitchen with the rest of the night tour guys we began to rummage through the collection and pull out the most odd shape, misspelled and different colored front pieces. Someone suggested it would be fun to put them on our helmet, over our company front piece held on by the tire rubber band we all had. Who had a green front, who had a blue, purple, silver. One had a star in the middle instead of a number. Mine said “Shrewsburg” instead of “Shrewsbury”. We had mish mash jelly bean colored front pieces on our lids. Well, of course, we catch a little job. During overhaul we come across a shoe box full of cash. As we collect our tools to take up we walk to the remaining BC at the scene. He takes the box, looks at our helmet to see our company designation. Looks twice, and tells the boss who was wearing the silver star front piece to “Take up and take those hideous pieces off”. How were the uniform buttons secured? Glued to a nut and then screwed on?